The 2050 Calculator project has shown that, although transparency and openness can be challenging, they also have huge benefits. By Laura Aylett, Policy Analyst at the Department for Energy and Climate Change. The policy problem facing the Department of Energy and Climate Change (DECC) in 2009 was immense. The Climate Change Act had just brought in the world’s first legally-binding greenhouse gas emissions reduction target. The UK had to cut 80 percent of emissions by 2050, taking 1990 levels as a baseline. These targets required a transition to a low-carbon economy. And that change would affect not just the type of power stations built in the UK, but also the decisions people make in their daily lives. With the technologies needed to achieve these targets still being developed, the best way forward was unclear. Convincing policy makers and the public that the problem was challenging and complex, but also necessary and achievable, was just as important as coming up with a solution. DECC’s Strategy Unit was tasked with looking at how the UK would make this transition. A book by Professor David MacKay, DECC’s Chief Scientific Advisor, gave the team inspiration. 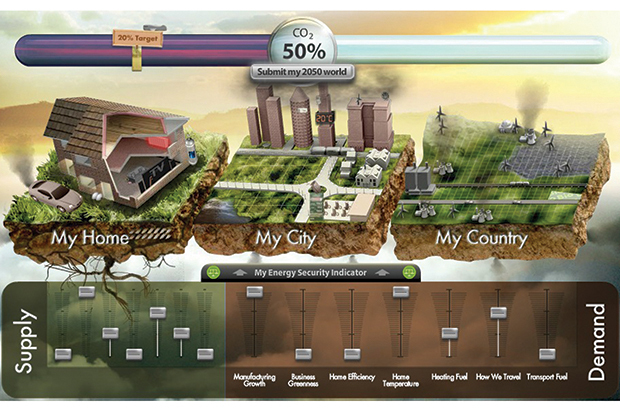 Sustainable Energy without the Hot Air discussed the technical limits of each low-carbon energy source. The Strategy Unit thought that an interactive version of Professor MacKay’s book could allow users to decide whether to reach our emissions targets by building wind farms or nuclear power stations, by insulating homes or increasing access to public transport. This idea led to the 2050 Pathways Calculator, a publicly- accessible model of the UK’s energy system that allows people to explore different ways of reducing emissions to help tackle climate change. This was a radically different approach to traditional government modelling. Models are rarely published, meaning the assumptions they make are not always clear. The team wanted to avoid this wherever possible. If an assumption couldn’t be explained, or the data wasn’t already published, it wasn’t used. Getting permission to publish was not easy. Understandably, economists in the Department were concerned about the Government putting out a model which could let people create unaffordable pathways. Policy teams were concerned about allowing options that weren’t in line with current policy. Everyone was worried that pressure groups and the press would be critical. After three months of working with experts from other Government departments and industry, the team had built a first version. Shortly after, in July 2010, they published the full Excel model, a web-based user interface, and a report. A call for evidence published at the same time received over 100 responses from members of the public, academics and a variety of interested groups. The anticipated risks of publishing this different type of model never materialised. The model was billed by DECC as a work in progress, so if errors were found, they could be corrected. And the team had already built trust with many potential critics when designing the model. Be honest about the challenges Government faces, and accept that sometimes there isn’t one right answer. Build in openness from the beginning. It is more difficult to reverse-engineer transparency. It is essential to record what you are doing and why as you go along. Use only publically available data. If the data is already available, publishing a model based on it is not very controversial. Keep control of the model. Outsourcing different sectors to different people can result in a lack of consistency and confusion later on. Consult, consult, consult. Talk to the experts and involve them at every stage. Your potential critics will be travelling with you on the journey. Publish the model as soon as you can. Accept that people will find problems, but it is better to find them early when they are easier to fix, and before policy is based on the work. You will have potentially thousands of people checking your work for free. Keep it simple. Experts have an understandable tendency towards complexity, but this can obscure the real issues. Many of these themes have now become embedded in DECC’s thinking. For example the realisation that we may need to double our electricity use by 2050 is one of the inspirations for the current Electricity Market Reform programme, which aims to encourage investment in low-carbon generation. By making the model open (both by publishing the numbers behind it, and also by leaving the results up to the user) the calculator has allowed people to engage with this complex issue in a practical way. Since publication, the calculator project has taken on a life of its own. Sciencewise ERC, a resource centre for public dialogue in science and innovation funded by the Department for Business, Innovation and Skills, approached the team about building a more user-friendly version of the calculator aimed at children. Over 17,000 people of all ages have submitted their pathway through this My2050 website so far, giving a unique insight into how people think about energy and the trade-offs that we will need to make. In 2011 the team was approached out of the blue by the government of the Belgian region of Wallonia, who wanted to build their own calculator. This experience showed that the model was flexible enough to be used for other countries. China soon followed, thanks to the support from the Climate Change Network at the Foreign and Commonwealth Office (FCO). DECC and the FCO are now helping ten developing countries to build their own calculators and better understand what they can do to lower emissions. This project won the 2013 Civil Service Award for Analysis and Use of Evidence. The team behind the calculator put this surprise success down to the model’s simplicity, flexibility and transparency – a level of transparency that was praised by the Macpherson report into Government analytical modelling as setting “a new standard”. Now the team is setting their sights even higher, by leading work on a Global Calculator, which will not only show what options are possible to reduce emissions on a world scale, but also the effect these choices would have on climate. By aiming this calculator at influential policy makers and business leaders, it is hoped it will help generate debate ahead of crucial climate change negotiations in 2015 when countries will try to reach a global deal. “We are committed to making the Global Calculator open and to publish the full model,” Jan says. The My2050 website is here. And more about David MacKay’s book Sustainable Energy without the Hot Air here.